NOW!Right now, is the time to be accountable and responsible for where you are financially, and more importantly spiritually and mentally. 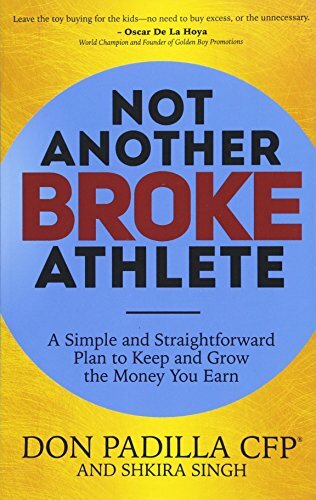 Not Another Broke Athlete is a spiritual awakening not only for athletes, but all human beings that want to break the "chains" of a poverty or scarcity mindset. Whether it's passed down from one's parents, grandparents, or great grandparents that have lived through bondages, holocausts, genocides, depressions, and or recessions: if they aren't aware then they will continue living in these vicious cycles, even if they are "rich" financially, which can lead to a "poor" unfulfilled life. Don Padilla's experience of going from getting kicked out of his home, being broke, almost bankrupt, near divorce and becoming a millionaire: and insights from Shkira Singh, Dr. James Verbrugge, James Malinchak, Oscar De La Hoya, Aaron Boone, Jacob Cruz, Dana Hammonds, David Meltzer, Joe Theisman, Warren Moon, Dr. Pat Allen, Dr. Mamiko Odegard and others, will provide the tools to break these cycles of a poverty or a scarcity mindset and lead you to a path to grow and protect your legacy.